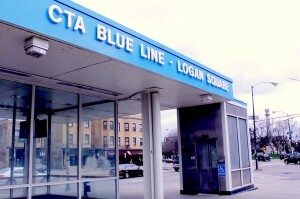 New murder hot spot: Hip Logan Square | Homicide Watch Chicago | Mark every death. Remember every victim. Follow every case. Others were surprised to learn of the recent spate of killings. Sergio Ortiz, 35, another longtime Logan Square resident, said the neighborhood has gotten much safer over the years. All five killings this year happened near the outside edge of Logan Square, away from its famed Illinois Centennial monument and roundabout at Kedzie Avenue and Logan Boulevard that many Chicagoans think of when they talk about the neighborhood. According to census data, it’s home to 74,000 people. Nearly half are Hispanic, about 85 percent have at least a high school diploma, and median income is about $53,000 — above the citywide average. The latest killing happened April 15. Authorities have refused to say much about what happened, just that a 58-year-old woman was found dead by a friend inside a residence in the 2500 block of West Moffat Street and that she’d been strangled. The Chicago Police Department and the Cook County medical examiner’s office wouldn’t say any more about the case, including the woman’s name. • On April 8, 24-year-old Mikal Johnson — a onetime star athlete at Rolling Meadows High School who later studied music at Columbia College Chicago — was gunned down in the 2700 block of West Bloomingdale Avenue. He was riding in a vehicle with a friend when two men drove up, got out and started yelling at them that they’d cut them off. When Johnson got out, he was shot five times. • On March 16, Deonta Jackson, 35, and Elijah Moore, 41, were shot dead outside the Dolphin Chicago nightclub, 2200 N. Ashland Ave. The police say they were part of a group security guards had just kicked out for fighting. The club’s operators have kept the place closed since the shooting. Ald. Scott Waguespack (32nd) said it should have been shut down long ago, saying it’s been the target of chronic complaints from its neighbors. • On Feb. 19, Julio Ramos, 30, was sitting in a sport-utility vehicle parked in the 2000 block of West Fullerton Avenue when a gray pickup truck pulled up, and someone inside shot him in the head. No one has been charged in any of the deaths. Last year, there were seven murders in Logan Square — the most since 2006. 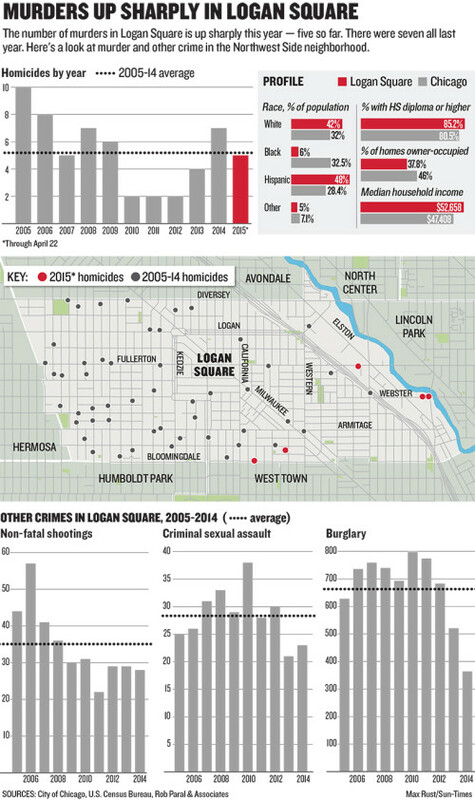 But crime overall in Logan Square is down, according to police figures. Non-fatal shootings have been trending down — from 57 in 2006 to 28 last year. And burglaries, — deemed a bellwether crime by police Supt. Garry McCarthy — have fallen each of the past four years. “I always tell people not to get worried, this is a big city, but to remain vigilant,” says Waguespack, who represents part of Logan Square.